DALI is full of useful and handy features which you can choose to use. Below is only a sample of the many features DALI can provide. DALI employs a digital transmission signal which makes it less prone to the transmission errors that typically affect analogue control signals. Unlike the older 1-10v analogue systems or the propriety DSI systems the DALI signal allows for Bi-Directional Communication which creates the ability to obtain functionality results directly from the DALI device. Below you can see DALI devices, these can be ballasts, transformers, LED controllers or emergency devices compatible with DALI. Up to 64 DALI devices can be connected to a line. Sensors, switches, groups or scene controllers can be connected anywhere on the DALI line. These are optional devices. A DALI power supply is required for every DALI loop and a DALI controller, or gateway, allows control of a DALI line. 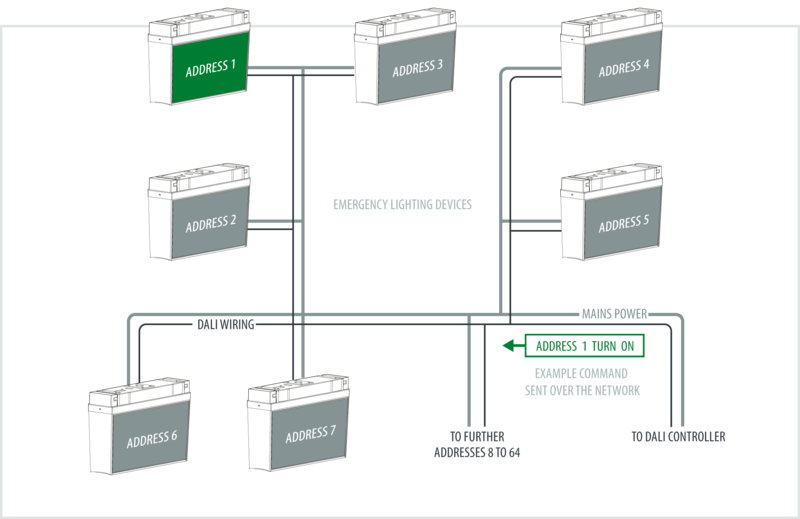 The DALI protocol allows for multiple controllers per DALI loop. Also these devices are optional. Each DALI device has its own address which enables individual communication and control over a single DALI line. 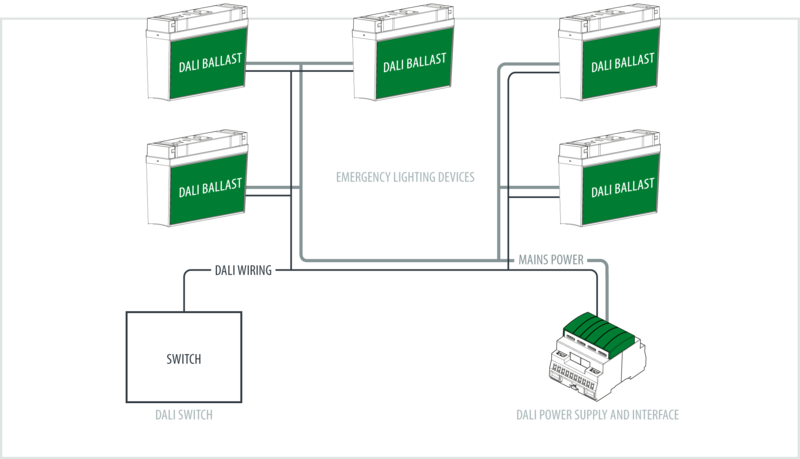 This means that you can wire up to 64 DALI devices together and control them separately, whereas traditionally you would need to wire each device separately. Individual control provides the means to gain the maximum power savings and comfort. HINT: Think of a command as a letter sent via the post. Only the person it is addressed to will open and read the letter. Individual control is exploited through a broad range of queries/commands, listed below. The feedback from the device provides the perfect method for minimizing maintenance costs of the building while ensuring a safe working environment. As well as individual control, DALI also supports two new concepts called Scenes and Groups. These concepts allow for the control of several different DALI devices with the use of one command. There are 16 different scenes available for each DALI line. When a scene command is sent across the DALI line, every DALI device receives the command and checks it’s memory. If it has a stored action the DALI device will perform the action, otherwise it will ignore the command. 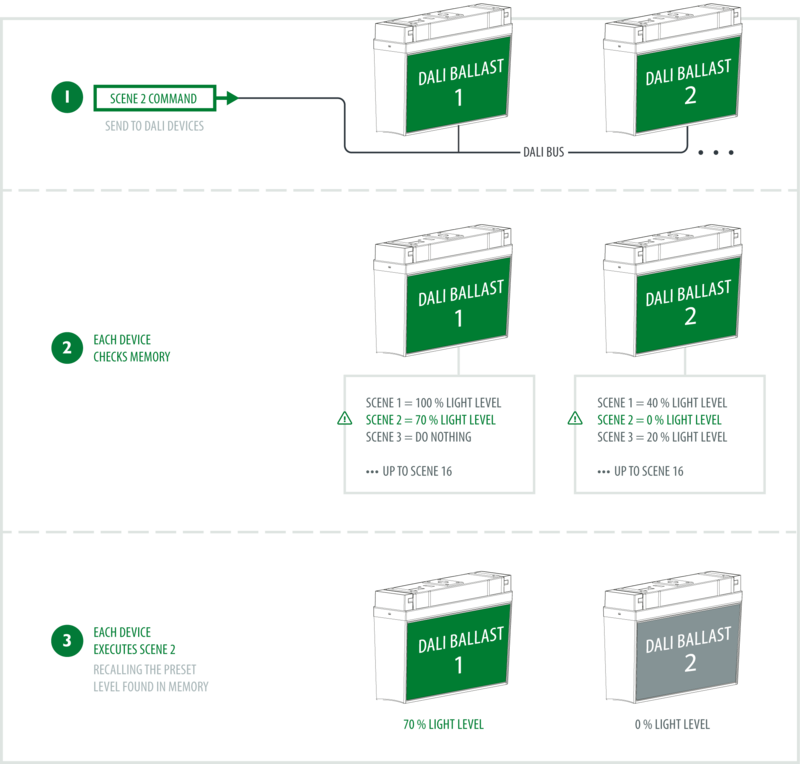 Groups allow multiple DALI Devices on the same line to be grouped together which allows the devices to perform an action together. Each DALI device can be assigned membership to a group or multiple groups. This grouping allows commands to be sent out in groups with all members of the group reacting to one individual group command. If a device is not part of the group it will be ignored. Because of the localised intelligence within each DALI device, it becomes possible to turn the DALI device on or off directly from the DALI control system rather than using a mains switch. This brings greater functionality and allows for flexibility and change after installation. NOTE: Traditional systems of lighting control do not always understand the application of groups and scenes. Many systems originally used each DALI device as an individual lighting channel, which is a slow and messy method. If you have ever seen a room of lights turn on one by one, then this is most likely a system which uses channel control and not group or scene control as was designed into DALI. Some system providers will also say that DALI’s communication speed is slow, this is normally because they have taken the channel approach to DALI. DALI devices have a number of features which can be changed to adjust the operation of the device. Some features are listed in the following table.